Thyroid functions and male fertility. Selenium, can help protect the skin against sun damage and skin cancer. And they may actually reverse some of the discoloration and wrinkles associated with aging. These antioxidants work by speeding up the skin's natural repair systems and by directly inhibiting further damage. Selenium is a natural antioxidant that slows the oxidation of polyunsaturated fatty acids and preserves the elasticity of tissue. Body By Natures food state selenium is an organic form of the mineral which is far better absorbed and used than inorganic forms of selenium. Selenium helps protect normal cell function in support of the body’s natural defences and eliminating harmful free radicals. Has been found to help prostate health, fertility and macular degeneration Provides help for the immune system by way of an antioxidant which ensures an adequate supply of Oxygen. A Food State supplement - uniquely provides nutrients in the same form as those in food Suitable for Men,Women, Children and the Elderly Suitable for vegetarians, vegans and for people with Candida and Yeast sensitivities Free from Genetically Modified Substances. Helps with key elements in the immune system. 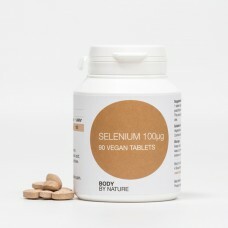 Thyroid function is maintained using Body By Natures own selenium. Selenium promotes healthy growth and fertility, as well as certain energy producing cells. DNA, lipids and proteins are protected from oxidative damage. Mineral enhanced yeast providing selenium, vegetable stearic acid, silicon dioxide, sodium carboxymethylcellulose. Wheat; starch; gluten; lactose; soy; added sugars, colourings, flavourings & preservatives.